Up for review are Top Flite golf balls. 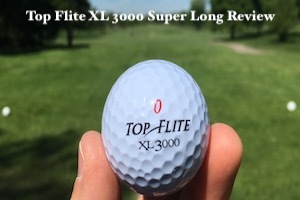 Every time I play a Top Flite golf ball I will write my review here and add the results to the golf ball leaderboard. I used to play Top Flites a lot when I was growing up in the 90s. Wasn’t that when they were really popular? It seemed to be the brand of golf ball my parents would buy and my brother and I would take a sleeve when needed. Just as I do with all of my reviews I will play one 18 hole round at Rackham Golf Course in Huntington Woods, MI near my house. 80 Degrees. No wind. Sunny. Why on Earth am I playing a ten year old golf ball? Well, if you’ve been reading some of my reviews you’ll notice I’ve been working through many different golf balls I found lying around in my dads old workshop. These Top Flite XL 3000 Super Longs have been sitting around for at least a decade and were unopened still in the wrapping. After talking to Mom this past weekend we believe Dad won these and other golf balls at outings. Ending the thinking that he liked buying distance golf balls. I swear, every single golf ball I found has “distance” or “long” in its name or slogan. I do not remember playing the XL 3000 Super Long as when they came out I think I was in a Callaway and Slazenger phase. There was something about the Top Flite logo and font that I did not like. It looked cheap in a way. Top Flite really sticks behind their golf ball. 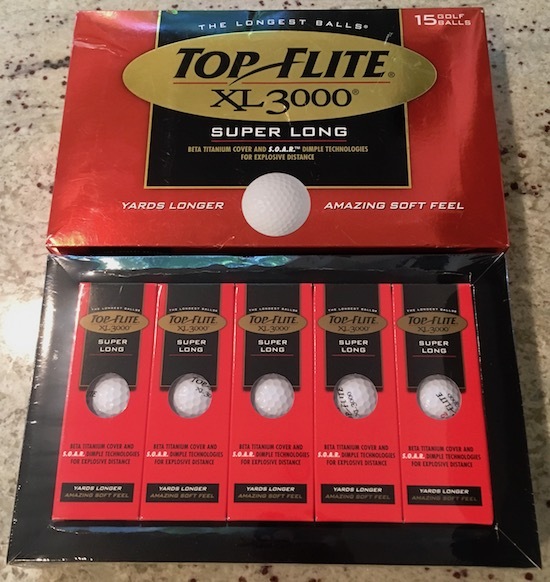 There is a “100% Satisfaction Guarantee” on the box stating “If you are not completely satisfied with the them to return the unused golf balls, package, and receipt for a full refund.” Now that’s some marketing. And the XL 3000 Super Long is able to do all of those things with its Beta Titanium Cover and Tungsten Core. Beta Titanium is of course, added to the cover for superior distance. And the Tungsten Core is of course, a very dense material which minimizes the need for fillers and provides a soft, responsive feel. Dont you just love Marketing? All of that is hilarious. But what if their right? Let’s find out. Off The Tee – Hit 7 fairways with driver. This was a very good ball to hit driver with. Outside of two drives that sprayed to the right I hit the XL 3000 Super Long dead straight or a baby draw with very good distance. There were no “Super Long” drives. And the ball didn’t roll out either. What I did experience just about every time I hit a good drive was my typical high launch angle (which Top Flite says will happen with the XL 3000 on the box) resulting in one or two hops and a stop. In some cases I was even getting backspin with the driver. Fairway Woods & Hybrids – Just great. I was picking the XL 3000 clean off the fairway and rough with these clubs. What was most surprising is the height and spin I was able to create with the 5 wood. On #11 I hit a towering approach from 200 yards with my 5 wood hitting the green and backspinning a foot. And then with the 3 wood it flew at mid height trajectory with little spin. 5 wood from 200 yards. Sorry about the picture. Very poor cropping. Its about 15 feet away. There was just a comfortability hitting fairway woods with the XL 3000. Did not use my hybrid. Irons – Started hot and fizzled out on the back 9 with the irons. The XL 3000 Super Long surprisingly had very good control even though it is a distance ball. Had two above average tee shots on both far 3’s on the front nine. One landed four feet from the hole and backspun. 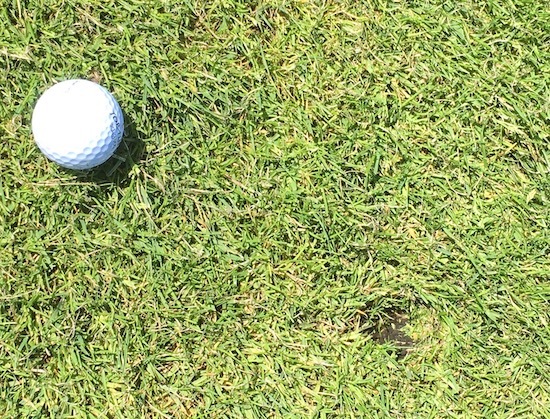 The other landed fifteen feet from the hole bounced once and stopped ten feet from the hole. Distance did not feel any longer with the irons but contact felt above average which was unexpected. Wedges – And this is where the XL 3000 Super Long started to go down hill. It blew a number of easy approach shots from 70 yards out. Hit two very good but went over and two others that came up way short. There was no spin nor did the XL 3000 check up once from shots around the green. Which I guess was to be expected. 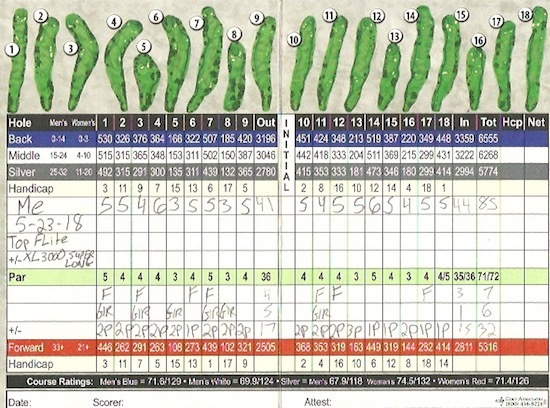 Putting – The scorecard says there was 32 putts which is decent. Unfortunately none of those five 1 putts were for birdie or even to save par. There was one 3 putt which was just sad. Out of the 6 GIR’s there were 4 legit birdie putts which missed by enough that they weren’t close. 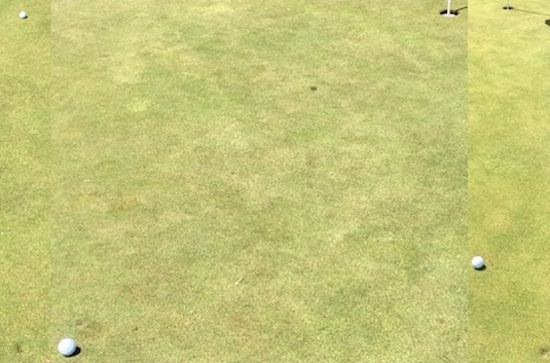 Did tap in for par on those but the story really is that the wedge game wasn’t great resulted in shots from the fringe or just off with the putter. 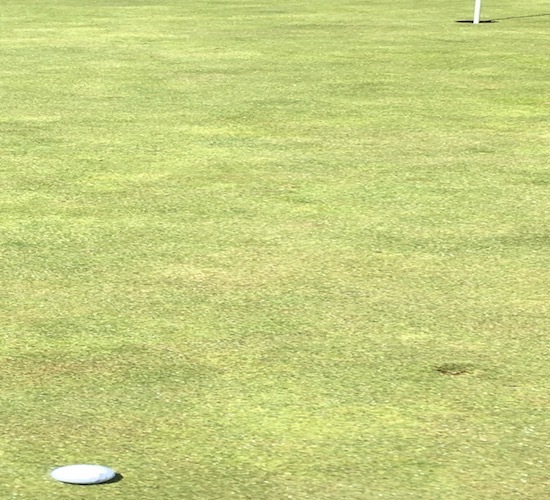 I used putter from off the green at least five times. The XL 3000 Super Long was just not a great ball to putt with. It was average all around. Durability – Did I hit a tree or two? Yes. But the tree did not leave a mark on the ball. What did leave a mark on the ball was it hitting the cart path after being thrown by the guy I was golfing with. Yes, the guy I played with picked up my ball from the green and threw it some 20 yards to the next tee box but it came up short and bounced off the cart path twice. He had played two balls on the 17th hole after duffing his approach shot. He played another one and sculled it over the green. Being the gentlemen I am I went and picked up his sculled ball over the green as mine was just over the green too. I rolled it near his ball he played onto the green which he did not see me do. While he was walking up I putted the XL 3000 Super Long near the flag. He had a brain fart. Picked mine up and chucked it in discust thinking it was his sculled ball. It was quite funny. Doing some preliminary research for the Top Flite XL 3000 Super Long I found out the Top Flite brand had been sold to Dicks Sporting Goods. Which I thought to be odd. But sure enough there was no TopFlite.com. Everything points to Dicks now. Seeing how this golf ball is at least ten years old I know it doesn’t have the performance of newer golf balls. But it was still a pretty good golf ball. It might have been “Super Long” a decade ago but it’s very average now. Possibly below average in some aspects. I still can’t get over the logo and font. 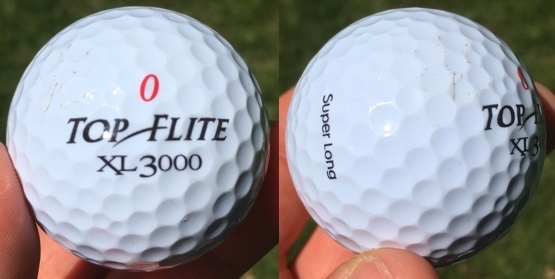 A comparable newer golf ball to the XL 3000 Super Long would be something like the Titleist Velocity. Luckily for the XL 3000 Super Long the course was playing better than the Schwetty and Pinnacle Long Drive I played the previous two weeks and it benefitted from it.